Should foreign business people re-brand using an “American Name”? Recently, one young woman handed me her business card during a reception for the International Leadership Foundation’s Young Ambassador Program. This is a select group of 60 college and post graduate Asians, who have come to the United States northeast this mid-summer to visit, tour and meet high level political and business leaders. She apologized for not yet having chosen an English name for herself. I asked her why she thought that an English name was necessary. Her response was that her Chinese name was too challenging to pronounce. I read her card and saw her first and last name had only two letters each, both monosyllabic. What could be simpler? Never was there an easier name to pronounce or remember; Bob Bob would have been tougher. She was one of several Young Ambassadors I met in the course of the event who introduced themselves in a similar manner. The group seemed to have been given a directive that everyone pick out an English name, so that as they established an American foothold their personal brand might be easier to remember. Now if Mahmoud Ahmadinejad decided he wanted to change stripes all together, perhaps Mo Acky might make for a smoother intro. However, look at how easily all the on-air journalists have learned to wrap his guttural jigsaw of a handle around their tongues. Performers seem to be split on the choice of name change. Certainly the rappers have frequently dumped their parent given birth names to embrace phonetically ‘Katchy’ spellings or inanimate objects. Who doesn’t want a glass of Ice-T or an instantly branded college degree – Dr. Dre? Movie stars traded in their European ancestry for decades so the masses didn’t have to learn how to pronounce the surnames of the diaspora. However, many international stars kept their foreign language names for their exotic distinction and beauty. One melts when hearing Jacqueline Bisset, Marcello Mastroianni or Antonio Banderas. It’s always been about business and branding. But as Thomas Friedman has proved, the world is now flat and the American immigrant experience has integrated dozens of cultures. So why the current push to assimilate by creating fictitious identities? The mission of the ILF is to help prepare the next generation of international young leaders to address the global business and political issues in a changing world. 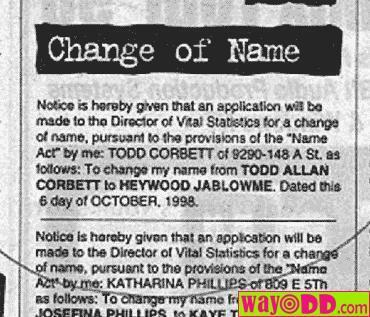 It’s not certain that personal name change needs to be part of that preparation. These young adults are slated to tour the White House and should they meet a former once and future leader by the name of Barack Obama, one wonders what his thoughts might be on this matter. This entry was posted in Uncategorized by ahvispin. Bookmark the permalink. It is interesting how much we take what others said for granted. Whenever I am part of a group, be it a club in Taiwan or some other program. The first thing everyone does when they are introducing themselves is to use an English name. People seems to assume that English names are the way to go. In fact some even go as far to claim that without an English nickname, you are jeopardizing the success your networking atempts in any given social event. The article “The Name Game” is the first article I’ve read which argues against this. It is true that our names are part of our identity, and to throw that away merely so others can remember you easier is rubbish. People will remember you because of your virtues, not because of some common name you’ve given yourself.